What do Starbucks (SBUX), Adobe (ADBE), Sherwin Williams (SHW), and Edwards Lifesciences (EW) have in common? Absolutely nothing, except that they all fall under the umbrella of stocks with so-called high “pricing power,” a phrase you may be hearing more about as Q1 earnings season gets underway. If that sounds like a dubious proposition to you, consider this: The last time Starbucks made news about a price hike was the middle of last year, when the cost of a cup of joe went up at thousands of locations by 10–20 cents (the third increase in three years).1 Since then, Starbucks has topped its earnings and revenue numbers each quarter,2 and its stock price is up more than 50% since last June. The reason you may be hearing more about stocks with pricing power is because many analysts expect the upcoming earnings season (which will kick into gear late next week) to be a departure from the past few record-breaking quarters. Although that’s advice for investors, it may also be a factor for short-term traders as companies start posting their Q1 numbers. 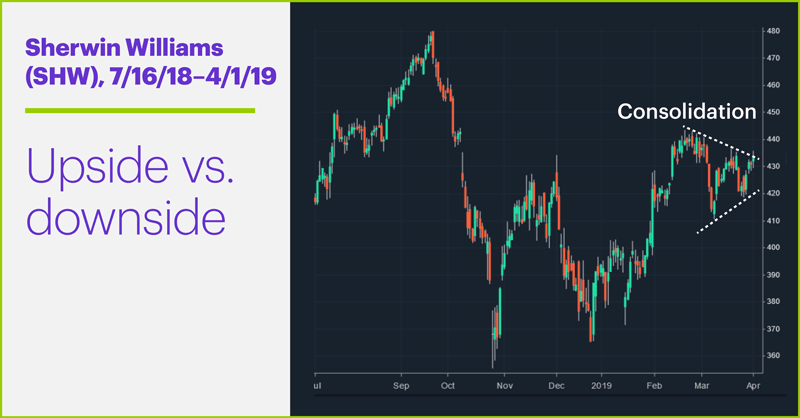 Just because a company is cited as having pricing power doesn’t mean its stock can’t go down, but it may be one factor among several that traders consider when looking for long-side possibilities during what could be a turbulent earnings season. As just one example, a trader considering different potential breakout trades may notice that SHW is a widely referenced pricing-power stock, which may make an upside breakout of its triangular consolidation more attractive than a downside breakout (chart above). Different pieces of information can carry different weight at different times in the market. Traders always need to be ready to adjust to a shifting landscape. Market Mover Update: Cisco (CSCO) broke out to a new long-term high yesterday, while Ubiquiti Networks (UBNT) followed up on Friday’s trading range breakout with a 3%-plus intraday rally (see “Sector gets wired”). The crude oil spigot was still open on the first day of Q2, with May WTO crude oil futures (CLK9) gaining more than 2% and pushing above $61.50/barrel. Yesterday’s Retail Sales number was weaker than expected (although last month’s was revised upward), while manufacturing and construction data topped estimates. Today’s numbers (all times ET): Durable Goods Orders (8:30 a.m.). Today’s earnings include: Walgreens Boots Alliance (WBA), Dave & Busters (PLAY), GameStop (GME). Click here to log on to your account or learn more about E*TRADE's trading platforms, or follow the Company on Twitter, @ETRADE, for useful trading and investing insights. 1 Fortune. Starbucks Quietly Raises Prices—Again. 6/7/18. 2 StreetInsider.com. 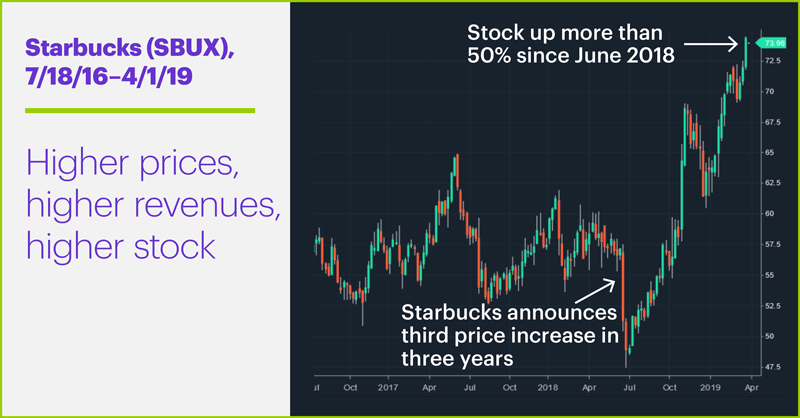 Starbucks Corp. (SBUX) Earnings. 4/1/19. 3 CNBC.com. Goldman: Earnings outlook is getting grimmer by the day, so hide out in companies with big margins. 4/1/19. S&P 500 bangs out its best Q1 in more than two decades. Forget blue sky—clouds may be the best part of Microsoft’s rally. The yield curve flipped, and the S&P 500 is having one of its best Q1s ever. What’s next for traders? Looking to expand your financial knowledge? Important Note: Futures and options transactions are intended for sophisticated investors and are complex, carry a high degree of risk, and are not suitable for all investors. For more information, please read the Characteristics and Risks of Standardized Options and the Risk Disclosure Statement for Futures and Options prior to applying for an account. You can also view the E*TRADE Futures LLC Financial Information and Disclosure Documents. This was calculated based on E*TRADE's Active Trader fees and commissions, and may have different results if executed with a broker charging different rates. Investing in securities involves risk, including possible loss of principal. Commodities are assets that have tangible properties, such as oil, metals and agricultural products. Investments in commodities and commodity-linked securities may be affected by overall market movements, changes in interest rates and other factors, such as weather, disease, embargoes, and international economic and political developments, as well as the trading activity of speculators and arbitrageurs in the underlying commodities. Investments in commodities or commodity-linked securities may not be suitable for all investors. The use of derivatives (futures, options and swap agreements) may create additional risks that would not be present in the underlying securities themselves, thus raising the potential for greater investment loss. Examples include a reduction in returns, increased volatility, exposure to the effects of leverage, and the risk that the other party in the transaction will not fulfill its contractual obligations. All options data, unless otherwise cited, is from WEX Trading Platform.